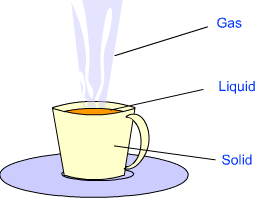 Liquid: Liquid has indefinite shape but definite volume. Examples: Water, milk, oil, etc. Gas: Gas has indefinite shape and indefinite volume. Examples: Oxygen, nitrogen, carbon dioxide, etc. Hard: Material which are difficult to compress are called hard, e.g. diamond, stone, wood, steel, etc. Diamond is the hardest natural substance. Soft: Materials which can be compressed easily are called soft, e.g. chalk, cotton, rubber, etc. Transparent: The material which allows light to pass through it is called transparent, e.g. acrylic sheet, glass, water, air, etc. 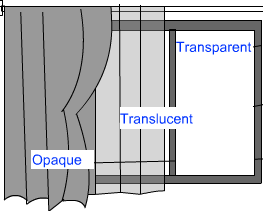 Opaque: The material which does not allow light to pass through it is called opaque, e.g. wood, iron, asbestos, etc.